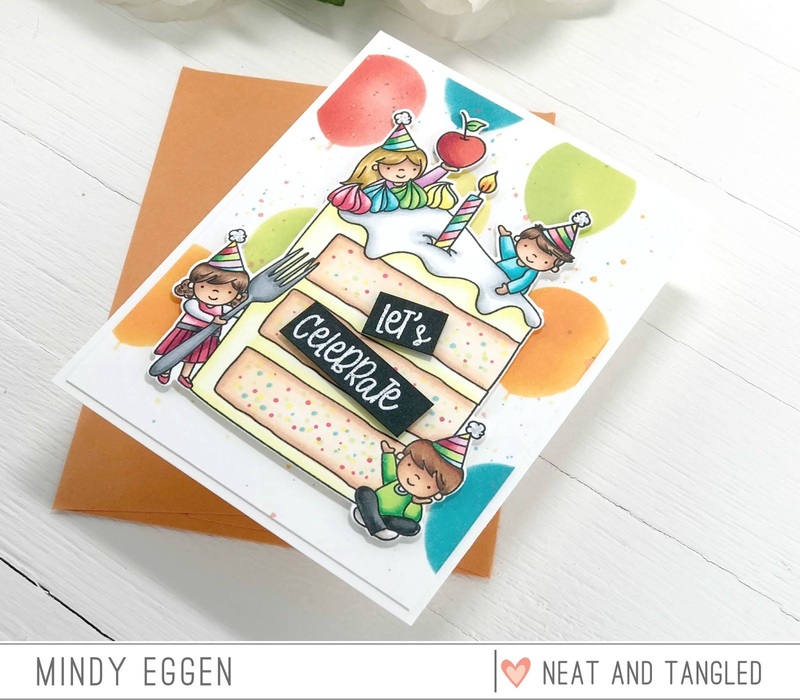 Welcome to Day 2 of the Neat & Tangled January 2019 release! Need birthday cards? I always do and never seem to have them on hand. The sets today are perfect and a must have in your collection! Todays is featuring Piece of Cake stamp set with a coordinating die and Piece of Cake Sentiments stamp set. 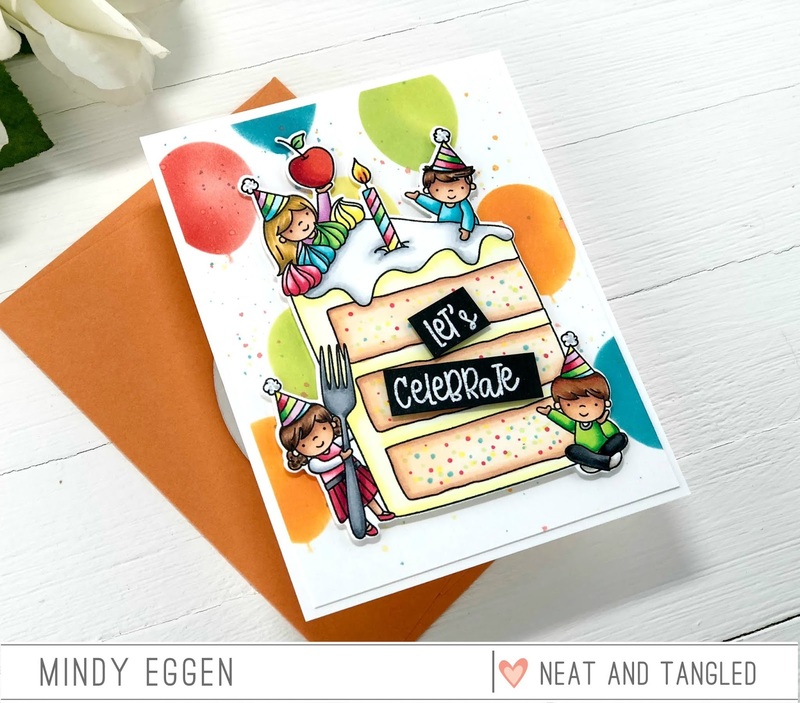 The Piece of Cake stamp set has this amazing large image great for focal points on your card. I stamped my image onto Neenah Solar white cardstock 80lb with copic friendly ink and colored with copic markers. Then I used the coordinating die to die cut it out. For my background, I used the Balloon Duo Stencil and added a variety of colors of balloons. This is such a fun, festive look! I trimmed down the stenciled panel to 4″ x 5 1/4″ and added to an A2 size notecard. Then I added my die cut cake piece to the front using foam tape for dimension. I heat embossed my sentiment onto black cardstock with white embossing powder. I trimmed the sentiment into two pieces and added to the front panel with foam tape. I love how it looks like labels! Such a great set and a must-have for your collection! The release will be available on Friday, January 11, 2019 at 8am EST. 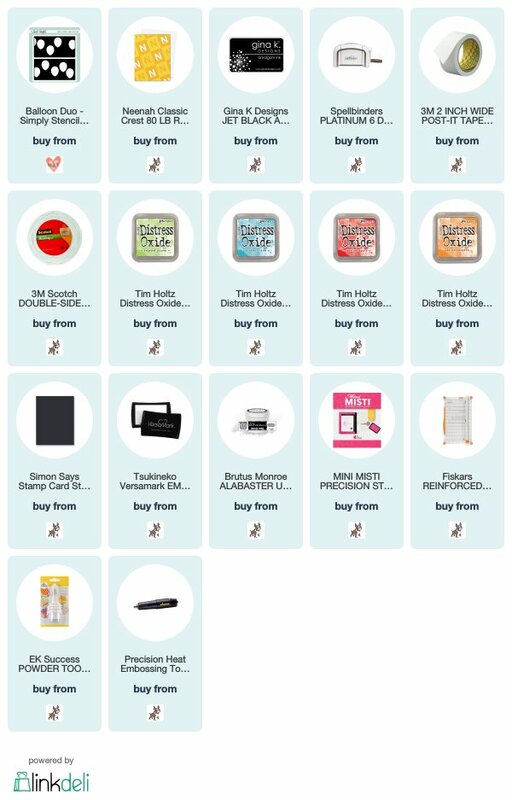 Be sure to leave a comment for a chance at winning a giveaway! Also head to the Neat & Tangled blog for more inspiration! That fun-fetti cake is adorable! Love your copic skills! Such a fund card! I love the balloon background and the confetti cake! What a great card! I just love it. Super fun birthday card! Your coloring is amazing and I love the stenciled balloons background. I love how colorful this is; so pretty! Also love how you made it a confetti cake. Yum! That is such a cute birthday card!! So cute, yummy and colorful! Adorable!! Love your fabulous coloring and that super fun balloon background! This image is so sweet and I love the fun colors you used. The balloons in the background are cute. I LOVE your coloring! Great background with the balloons! Fantastic bright background with the fun balloons, great cake design. Popped this on my list for friday. Thank you for sharing inspiration. Very fun & festive card! Love the big cake slice! Awesome card! I especially love the added balloons in the background, great sentiments! Adorable card. I love all the bright colors!!! How cute!!! Love your sweet and yummy card!!! What a fun card! I really like the balloons in the background and the way you've coloured the cake! Adorable card! I love that you made fun-fetti cake – too cute! 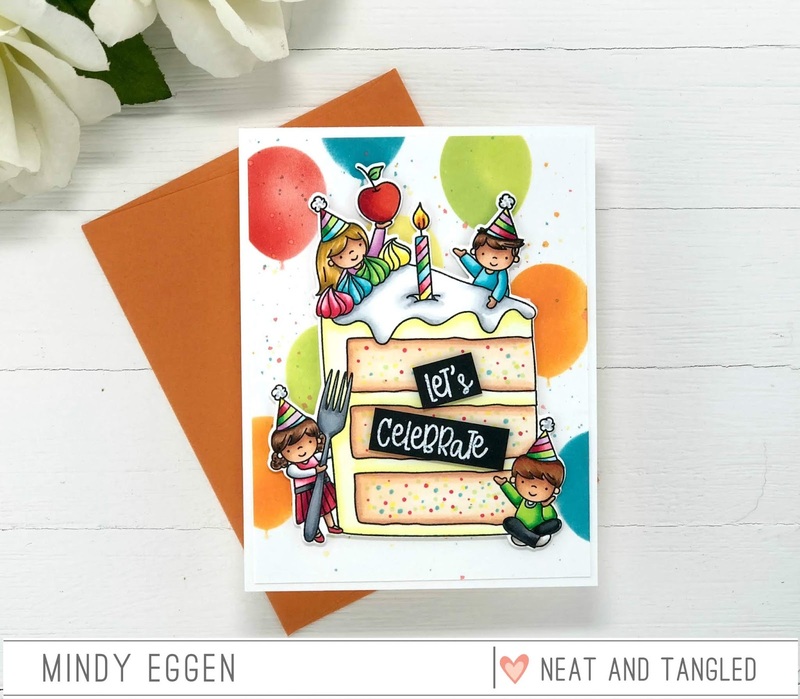 Such a fun card with the stenciled colorful balloons in the background.